REC Coordinator Omari Moore at King Academy teamed up with the Englewood school staff and student body to organize a rally and peace march against bullying and violence. Read about his experience below. For years now, October has been designated as Bullying Prevention month and is typically used as a time and space for educators and others who work with children to grapple with the effects that bullying has on all types of people. At the beginning of the 2017-2018 school year, I was asked by Principal Thurmond at Dr. Martin Luther King Academy of Social Justice a.k.a. 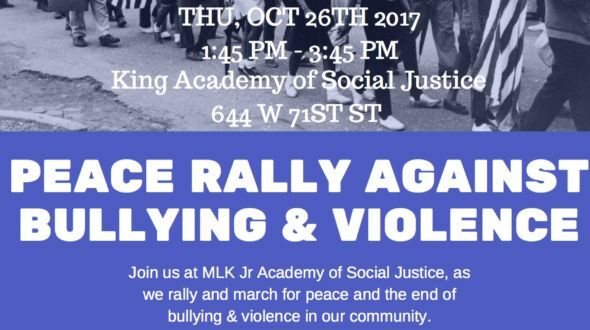 King Academy in Englewood to organize a Peace Rally and March Against Bullying and Violence for our Spirit Week. I took on this project because I ultimately saw the march as an opportunity to give students the space to protest some of the conditions they deal with daily, bullying and violence. Throughout the process of putting together this rally and march, there were a couple of key points that really stuck out to me. First, it was to get buy in from the staff, and more importantly the students at King Academy. Second, the preparation and planning I went through was worth the experience of the rally and the march itself. Preparing for the rally and march brought the most anxiety for me, primarily because I was concerned with staff and students not being interested. However, staff and students were immediately excited when they first heard about the Peace Rally and March against Bullying and Violence. I then connected with the King community for any Spoken Word performer contacts that would help excite everyone during the rally, and I was able to invite a keynote speaker from the Illinois Council Against Handgun Violence. Secondly, King Academy’s student body is super talented, our drumming group was asked to perform along with a Trio. My last worry was figuring out who was going to lead the march. I knew we needed someone with charisma to corral students with chants and lead them along the parade route. Thankfully, we have a wonderful principal at King Academy who was ready and willing to be the leader for the march, and Principal Thurmond even had a bull horn! The Rally and March themselves were a great experience. First, I was blown away when I walked into the gymnasium because there was an entire marching band in there. Principal Thurmond utilized a relationship she had with the Butler College Prep band director and asked them to lead our march. We kicked off the rally by giving a short description of the event and introduced the Butler College Prep band, who then played and got our students very excited. Our middle school drummers performed and then we had our spoken word artist speak on the importance of peace and nonviolence in our communities. Finally, our keynote speaker spoke on the impact of violence in our communities and how students can do something to prevent it and different forms of bullying. Afterwards, we exited the gymnasium and lined up in front of the school with the marching band in front followed by our students. As we began marching the band would play and then Principal Thurmond would call off the chants and our students responded. As we walked along Halsted street we had so many drivers slow down to honk their car horns in support of the children marching, we even had a couple of people that stood on top of cars so that they could record the kids marching. Students were full of smiles, laughs, and caught the urge to dance! Overall, march was a powerful experience and I am so happy that it all came together and gave kids the experience of protest. In conclusion, the process of putting together the Peace Rally and March against Bullying and Violence demonstrated to me that the work I do allows us to use so many creative ways to reach the children that we work with. We can’t wait to do it all over again next year!